You can open PDFs and images in Preview, change how documents are shown in the Preview window, and get information about the files. You can double-click a PDF or image file to open it by default in Preview. You can also open Preview and select the files you want to view. In the Preview app on your Mac, choose File > Open. Locate and select the file or files you want to open, then click Open. Tip: To open a file you’ve worked on recently, choose File > Open Recent. To open a document in iCloud Drive, click iCloud Drive in the Finder sidebar, then double-click the PDF to open it. See Use iCloud Drive to store documents. From the Desktop, you can also select a file or files, then choose File > Open With > Preview. If you open multiple files at the same time, you can set them to open in the same Preview window or open in tabs. When you open a PDF with multiple pages, you can view thumbnails of all the pages in the sidebar. In the Preview app on your Mac, open a PDF or image that you want to view. Show thumbnails: Choose View > Thumbnails or View > Contact Sheet. Show a document’s table of contents (if it has one): Choose View > Table of Contents. Close the sidebar: Choose View > Hide Sidebar. Show pages in a continuous scroll: Choose View > Continuous Scroll. Show one page at a time: Choose View > Single Page. Show two pages side by side: Choose View > Two Pages. Scroll pages: Swipe up or down on the trackpad using two fingers. Go to a specific page: Click a thumbnail, or choose Go > Go to Page. Go to the previous or next page: Click the Previous button or the Next button in the Preview toolbar. (If you don’t see the buttons, choose View > Customize Toolbar, then add them.) If your Mac has a Force Touch trackpad, you can accelerate through the previous or next pages by pressing and holding the button, then adding pressure; the more firmly you press, the faster you move through the pages. 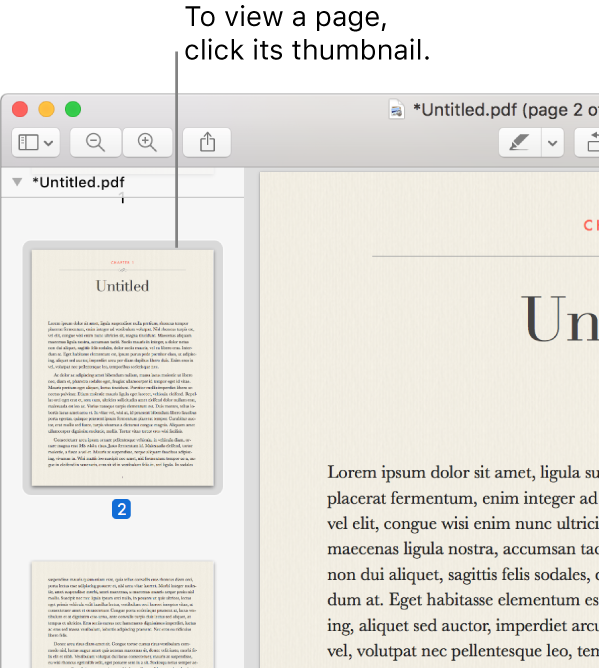 If a window sidebar contains multiple PDFs, you may have trouble finding a particular document. You can collapse a PDF’s page thumbnails so you see only the PDF’s filename. View thumbnails: Choose View > Thumbnails or View > Contact Sheet. Sort thumbnails: Control-click a thumbnail, then choose an item from the Sort By submenu in the shortcut menu. The thumbnails are sorted by file. You can’t sort PDF page thumbnails within a PDF. Change the size of the thumbnails: Choose View > Thumbnails, then drag the sidebar’s separator to the left or right to change the width of the sidebar. Collapse or expand PDF thumbnails: Click the arrow next to the PDF’s filename in the sidebar. You can use the Inspector to view information about a document or image, such as file size, the author’s name, and the image resolution. Get general file information: Click the General Info Inspector button . View keywords: Click the Keywords button . See Assign keywords to a PDF or image. View a list of annotations: Click the Annotations Inspector button . To display an annotation, double-click it. See Annotate a PDF or Annotate an image. View encryption and permission information in a PDF: Click the Encryption button . See Password-protect a PDF. View cropping information in a PDF: When using a selection tool, you can click the Crop Inspector button to view the dimensions of the content you are selecting, and choose a unit of measurement that’s displayed in the Crop Inspector window. View information about an image: Click the More Info Inspector button . See See where a photo was taken. Zoom in or out: Choose View > Zoom In or View > Zoom Out. On some trackpads, you can pinch your thumb and index finger closed or open on the trackpad. See Use trackpad and mouse gestures. View the original size of an image or page: Choose View > Actual Size. Zoom to a particular section of an image or PDF: Choose Tools > Rectangular Selection, select the section, then choose View > Zoom to Selection. View a page at a specific percentage of its original size: Type a percentage in the Scale field in the toolbar. If you don’t see the Scale field, choose View > Customize Toolbar, then drag the Scale field to the toolbar. Magnify an area in an image or PDF: Choose Tools > Show Magnifier, then move the pointer over the area you want to magnify. To stop magnifying, choose Tools > Hide Magnifier or press the Esc key.